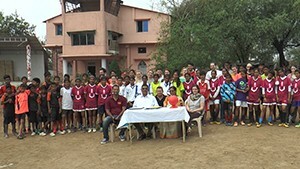 Slum Soccer celebrated the twinning their Academy football pitch with Flanders Peace Field and The Peace Village, Messine, Belgium, site of the 1914 First World War Christmas Truces. The Peace Field plaque (sponsored by Jones Lang Lasalle, JLL) was presented to V’jay Barse the founder of Slum Soccer by Ernie Brennan, Managing Director of the National Children’s Football Alliance. ‘This is a very important part of Slum Soccer to have a peace pitch that promotes play to young and old people. The connection with the First World War’s, 1914, Christmas Truces and India, is a valuable historical and modern day learning tool. We will promote peace through play and continue to work with our partners to ensure all children benefit from football’. Dr V’jay Barse, Slum Soccer. Dr V’Jay Barse signs the Peace Field Declaration.